The Telangana state government has decided to set up Telangana martyrs' statue at Hussain Sagar with international standards. Guidelines on matters relating to arrangements have been issued by the Chief Minister KCR. The tasks were to be designed to be more impressive than before. The Telangana government took another key decision. In the formation of The government hopes to set up the Telangana martyrs' stupa in memory of their survivors. The KCR also approved and approved the CE officers to set it up with international standards. 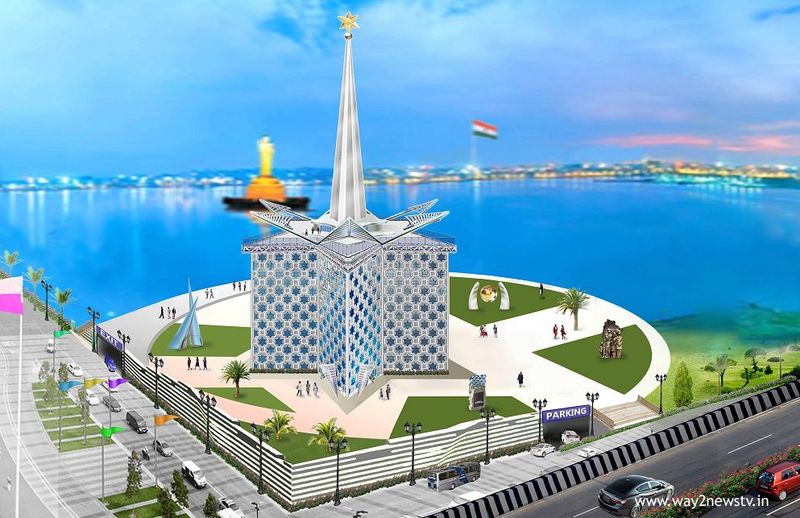 Also: A statue of Buddha along Sagar on the banks of Hussain Sagar and the huge national flag flanked on the back of the river will be built on the same line. A beautiful park and water fountain will be set up to ensure a pleasant atmosphere at the stupa premises. Another pillar in the center of the park is the design of the pillar to design the Telangana Mother's statue.The martyrs' structure, which is built with an estimated 80 crores, can be viewed as a seven-story maid. 2 floors are allocated for parking in the cellar below. On the ground floor, there is a service floor. The first is to use the marijuana floor and the second floor of the convention hall where the commemoration is to be celebrated. The restaurant on the third floor is arranged. In the shape of a lamp, the fiber material will be used to lighten the shape of the cylindrical glow of electric light. The key design proposals for this project were signed by Chief Minister KCR. The government thinks it should be constructed without any compromise. In the first month of March, officials also began to call the tenders.